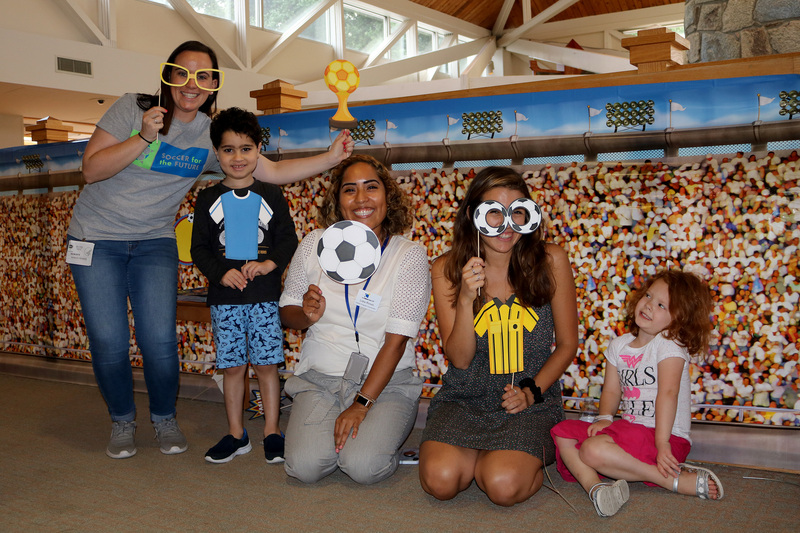 The nonprofit Soccer for the Future hosted a World Cup watch party for Inn residents recently, bringing soccer fans of all ages and countries staying at The Inn together for snacks, team fan art activities, friendly banter and a soccer themed photo booth. Hannah Penman, a two-time rare cancer survivor who played soccer in high school and college, founded Soccer for the Future in 2013 to bring fun and support to child cancer survivors while teaching them about soccer. This year, she’s expanding her outreach beyond oncology patients by working with seriously ill children at The Inn. On Tuesday afternoon residents gathered around a large screen TV in The Inn’s breakfast bistro to watch the Nigeria vs. Argentina game. Children, young adults and parents from different parts of the United States plus Jamaica, Mexico, China, the Palestinian Territories, Uganda and other countries gathered on the couches, lounge chairs and pulled up additional chairs to share in the excitement of the World Cup together. Click here to see photos of the watch party.